§ 18. MEANWHILE the man of God began to wax strong in the spirit of prophecy, to foretell future events, and to describe to those he was with what things were going on elsewhere. Once upon a time he left the monastery for some necessary reason, and went by sea to the land of the Picts, which is called Niduari. Two of the brethren accompanied him; and one of these, who afterwards discharged the priest’s office, made known to several the miracle, which the man of God there performed. They arrived there the day after Christmas-day, hoping, because the weather and sea were both tranquil, that they should soon return; and for this reason they took no food with them. They were, however, deceived in their expectations; for no sooner were they come to land, than a tempest arose, and prevented them from returning. After stopping there several days, suffering from cold and hunger, the day of the holy Epiphany was at hand, and the man of God, who had spent the night in prayer and watching, not in idleness or sloth, addressed them with cheerful and soothing language, as he was accustomed: “Why do we remain here idle? Let us do the best we can to save ourselves. The ground is covered with snow, and the heaven with clouds; the currents of both winds and waves are right against us: we are famished with hunger, and there is no one to relieve us. Let us importune the Lord with our prayers, that, as he opened to his people a path through the Red Sea, and miraculously fed them in the wilderness, he may take pity on us also in our present distress. If our faith does not waver, I do not think he will suffer us to remain all this day fasting—a day which he formerly made so bright with his heavenly majesty;—I pray you, therefore, to come with me and see what provision he has made for us, that we may ourselves rejoice in his joy.” Saying these words, he led them to the shore where he himself had been accustomed to pray at night. On their arrival, they found there three pieces of dolphin’s flesh, looking as if some one had cut them and prepared them to be cooked. They fell on their knees and gave thanks to God. 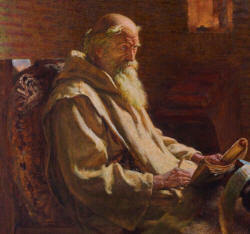 “You see, my beloved brethren,” said Cuthbert, “how great is the grace of God to him who hopes and trusts in the Lord. Behold, he has prepared food for his servants; and by the number three points out to us how long we must remain here. Take, therefore, the gifts which Christ has sent us; let us go and refresh ourselves, and abide here without fear, for after three days there will most assuredly be a calm, both of the heavens and of the sea.” All this was so as he had said; three days the storm lasted most violently; on the fourth day the promised calm followed, and they returned with a fair wind home.